In 2015 we introduced our Lunch and Loom sessions. We wanted to provide an innovative way for the business community to become involved with Passing Hats during their lunch hour. There is no better way to introduce a hands on experience for employees to learn a new skill, connect and build team spirit, connect, and participate in a wonderful community outreach program. 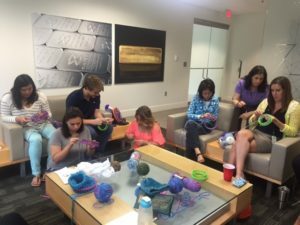 A representative from Passing Hats will come to your place of business and bring looms for each employee to create a knit hat that will be given to a cancer patient. Each participant is asked to donate 2 skeins of yarn and the company is asked to provide lunch for the employees.